Cloth Papers Scissors, special Studios edition is having a virtual Studio tour! More information to follow!! Wow, this has been a real learning curve! It's the first time I have attempted to cut and copy anything from anywhere and I figured it out..I think! Of course now I have no idea why everything has decided to underline itself, but that will be figured out later. However, what I want to let you know about is this...Cloth,Paper,Scissors Studios magazine is having a virtual studio tour taking place on October 3. 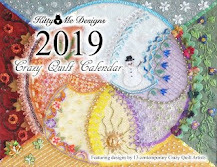 All sorts of studios will be linking to the website at the magazine and we can then all snoop through some fun places and see what others to store their crafting supplies. You just have to post a picture of the magazine on your blog, link back, and agree to post pictures of your studio (good, bad or ugly) to your blog anytime before Oct. 2. No eye candy from me today folks, however....SharonB has finished a most gorgeous crazy quilt that you have to see! Go here. Arlee has written her first article on the MrXStitch site and it's an interview with Jude Hill, who is another of my favourite reads. The article Arlee wrote is here. Jude writes two blogs here and here. The work Jude does is totally different than what you normally see, all done by hand, and all with incredible meaning. See? You don't need photos from me when you have so much to check out! Enjoy. I was wondering what I would post about today and while reading the latest from one of my doll groups I came across a very interesting article about criticism and our insecurities about our art which I felt I should pass on to you. We all seem to have pretty thin skins when it comes to dealing with outspoken critics of our work,especially when the criticism isn't of the constructive sort. Check out today's post at Glo von Gesslein's blog here. I know I've posted pictures of sunflowers before, but this one is rather odd...see the petals growing out of the middle of the flower? I do hope this isn't the last rose of summer because we have lots of buds left! I've been spending the afternoon doing a 'hunter/gatherer' stint. Hunting for something I can't find and gathering 'stuff' into piles so I might be able to find other things when I undertake to look for them. I absolutely KNOW I printed off directions to make roses using duct tape...bought the tape...can't find the darned directions. Argh! They're in here....somewhere......but where??? The 'label' part of this post is arising because of my post from yesterday. I am reminded as I go through all the old photos of how very important it is to label each and every one thoroughly as to who they are and date them if possible. Simply labeling a photo with an 'Uncle Bob' or 'Aunt Jane' does nothing to help historians and genealogists because, chances are, there are several Uncle Bobs and Aunt Janes in the family tree! Believe me, I know this, because there is a John, William and Robert in every one of four generations in my line. I have a number of photos labeled 'Uncle Bill', but that really doesn't tell me anything that will identify a picture definitively. When the name was written onto the photo of course everybody in the family knew who 'Uncle Bill' was, but future generations won't. So, here's my hint (rant?) of the day....label ALL your pictures with proper names (William John Smith....not Bill, or Uncle Bill) and date them. Your descendants will thank you! These are all pictures of my ancestors! My cousin visited today and brought me two albums full of photos, plus a small heap of cabinet cards (only a few of which are shown above). I have happily spent the afternoon scanning and photocopying what I might be able to use in 'the book' or in the next one (written by the original's son). There were also a number of family photos from my dads life (some of him when he was a young man) and some from my generation. To say I'm thrilled is the understatement of the year!! Sorry folks, no picture today because I haven't had a chance to do anything other than work on 'the book'. However, this was on the front page of the Toronto Star newspaper this morning and it falls under the category of how STUPID people can be....under the headline "Shoplifters pay for TV confession"....."Even by the confessional standards of the Dr. Phil television show, it was a whopper of an admission. The nicely dressed couple said they had roamed several states as shoplifters, stealing mostly toys, selling them on the Internet and making as much as $1 million (US) over seven years"....."I'm no lawyer or a cop," said show host Phil McGraw, incredulously, "but isn't that a federal crime?". The article then goes on to say that a federal grand jury in San Diego handed down an indictment against Mathew Allen Eaton, 34 and his wife, Laura, 26 and are using a transcript of the show as evidence. 2nd 'edit' to add this...thanks Irene for noticing that the part of my post referring to the spindles was awol! The spindles were picked up at the antique market referred to below for $1 each. I don't think they're really classed as 'antique' because there were too many of them and they were pretty cheap. No matter tho, because I liked them and can envision a doll coming out of them at some point. Sorry about the lack of post yesterday, but the above picture sort of says it all. This was part of the venue for the outdoor wedding we attended yesterday. It was lovely and the weather was perfect. While we were there, we had some time to kill, so we made the *mistake* of visiting a combination antique/curio mall and you can see that I was rather bad and added some more books to my already overflowing collection. I haven't had a real chance to read any of them, but the pictures in the gourd book are spectacular. The fall issue of Knitty is online, and you might want to check it out. They have a couple of contests going on to celebrate their new look too. 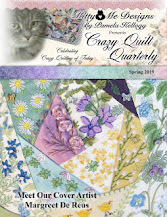 They always have a number of free patterns and interesting articles. AND...last, but certainly not least, our illustrious (and industrious!) leader of the Art Doll Coolaberation 2009 has created a new blog just for entries about the round robin dolls. If you want to keep up with what we're creating and see the latest additions to the dolls, have a look here. She will be adding more to it as the dolls are on their travels and I know you will enjoy it! Well, actually it's only one doll and one chicken! Before you ask, no I don't collect chickens, but I fell in love with this pottery one while poking through one of the antique/curio shops we were in yesterday. I have several small open shelves in my kitchen and she fits perfectly. My kitchen is primarily blue so she looks quite at home. Gail from Dollistic is having a draw on her blog for a little 5" Halloween witch doll she has made. It's adorable, so hop on over there and enter to win! While you're at it, why don't you think about joining us on our Decidedly Different Doll group on Yahoo? We're currently taking sign ups for a Halloween (4") doll swap, and several other fun challenges are going on. AND, my 'Key To My Brain' doll just won the most votes in our metal challenge (I was thrilled!). It's a friendly, no pressure group so check us out! Remember a little while ago when I said I'd won a drawing on Planet Purl for 16 balls of yarn? It came today, and I'm so thrilled with it! The colour is perfect and it feel divine. It will make a lovely short sleeve top once I find a nice pattern I like. The yarn is 'Linarte' by Lana Grossa (from Italy)...40% Rayon, 30% Cotton, 20% Linen, and 10% Polyamide and calls for either 4 or 4.5 needles. I will have to research to see if that's in mm, but I expect it is. Unfortunately the band doesn't have the universal # that would help to narrow down the pattern choices. I must remind you though, that my "speedy" knitting won't result in a completed sweater for at least three years, so don't hold your breath waiting to see it! Thank you Planet Purl...you rock!! Another garden picture, because obviously nothing creative is being done. The bee on the sunflower is accomplishing more than I seem to be! However, in my defense, 'the book' is coming along. I'm approaching a third done (127 pages typed...one of my typed pages is pretty much equaling 5 of the original diary). I try to do two or three pages per day, but that doesn't always happen. So...after I did my daily pages today...I parceled up Bravura (the latest Art Doll in the collaberation) ready to mail. Then I started to shovel out my studio so that I could change gears and work on another project for awhile. I signed up to swap a 4" Halloween doll so that might be my next project...or...gasp.....I might go back to work on my coat!! Decisions, decisions. Today has been one of spinning my wheels and accomplishing nothing of interest to anybody (including me). So...for your viewing pleasure, two more garden pictures. Above is the neighbours sneaky morning glory that is blooming beautifully on OUR side of the fence, but on hers, not so much. Our side of the fence gets the morning sun which morning glories seem to like. Below is the pink-tinged sedum we have in the front garden. It is just starting to turn colour and will get much redder than this in a couple of weeks. It's a plant I particularly like because it has rather interesting foliage AND turns the most lovely colour in the fall. It's also a simple plant to look after...stick it in the ground and watch it do it's thing! Perfect plant. Here are the four journal pages I completed to go along with Bravura. Her 'story' is that she is a real heart breaker and leaves many men behind. I decided that the reason she did this was because "It all comes down to who does the dishes". Obviously she has yet to meet a man who does this dishes! I used various techniques to do these pages. The 'dishes' page was simply a photocopy of the material I used for her cape, with the addition of some glitter in the sealant. The tears are flat-backed 'beads' meant for scrapbooking I think. Page two (the pic of Bravura)...I laid down a piece of aluminum foil. Over that a single layer of paper napkin. Painted all over with black folk art paint. After it dried, I lightly brushed over it with Twinkling H2O's. Let dry and carefully peel away from foil. After I added the quote and the picture of Bravura, I sealed with a coat of water based varnish. PAge three (bottom left) has watercolour paper, moistened on both sides. Drops and 'spluges' of H2O's with some salt sprinkled on top. There are five tags inside the pocket. Page four (bottom right) began with a piece of watercolour paper, moistened well on both sides. I painted it with purple folk art paint and let it dry. Stencil it using gold paint and sequin waste. Circles were stamped using the bottom of a bottle dipped in paint. The 'trim' along the side is fine glass beads, to represent tears. 30 Years with this man!! Thirty years ago yesterday I married a wonderful man. 30 years in some ways feels like a very long time, and in other ways it seems like just yesterday. He's a good man and I consider myself a very lucky woman to have him in my life and to have him as the father of our sons. Here's hoping we're lucky enough to have thirty more years together. These are some pictures from our road trip yesterday. It's hard to believe but the greenery in the front of the picture above is actually onions. A whole huge field of them! This is in the Holland Marsh, which is the area where a large percentage of our vegetables are grown and marketed from. Below is a picture of one of the massive wind turbines we saw. They are absolutely spectacular to see up close. Hopefully they will continue to be erected to provide for our hydro electric needs in the future. Finally, this picture is overlooking Georgian Bay and was taken in a little park we stopped at. There were a couple of sailboats out there, but too far away for a picture, so I settled for this pretty-sounding fountain instead. We had a lovely day! Thank you to everyone who wished us a happy anniversary. p.s. Jack has Mitzy (the cat) and Gypsy (the dog) on his lap in his photo. He can't form a lap without attracting animals. Bravura is the latest doll I've been working on for the Art Doll Coolaberation. She's a fragile lady, but a huge heart-breaker and leaves a trail of disconsolate men behind her. Her skirt is a glass vase (and believe me, I worry about breaking it!!). Her upper body is made from papier mache. I made her a cape, trimmed with a beaded fringe. The picture doesn't show it very well, but the purple fabric is very shiny and textured. I only had a little bit and fortunately I was able to get enough. It's lined with green dupioni silk. Because Bravura is such a heart breaker, she now has a lachrymatory bottle, full of tears shed by all her conquests. She even has a wee book that contains all the names of the men she has left behind! She also sports a beaded necklace (with a nod to Betty Rubble from the Flinstones!). Someone said Bravura was reminiscent of Betty, so I HAD to make the beads!! While Bravura was visiting with Barb, she got her lovely dress and her skin (which is fantastic!). Now I'm working on her journal and will post pictures when I'm done. The pictures today are from our garden. Figured I should be taking some photos of the remaining ones, because it's bound to be a long winter. The flowers in our garden will disappear with the cold, but the flowers on Allison Allers new quilt are of the forever sort. Be sure to scroll down in her post and then click on the quilt to enlarge it. You will be glad you did! This is what I spent my afternoon working on. They're pouches made from handmade paper I put together using my sewing machine and then added the ribbons at the top. These will be filled with fresh rose petals and hung at the ends of the rows of chairs at the wedding. It's an outdoor wedding so let's hope the weather co-operates!! (oh...the wedding is the daughter of a friend of mine). Speaking of roses...I wonder if this will be the last rose of summer in our garden. Hope not! Bubble, bubble, toil and trouble! On the weekend I used the pipe shibori technique, mid weight denim material, and bleach to create what you see below. First I basted the fabric into a tube that would fit around a piece of plastic pipe I scrounged from the garage. The plastic pipe was placed inside the tube and then the fabric was scrunched down the pipe (you can see it in the top photo). I immersed it in water to be sure the fabric was wet and then drizzled bleach over it. After about five minutes (and much peering into the pail to see what was going on), I immersed it all in a vinegar/water solution and let that soak for a few minutes to stop the bleaching action. There was lots of water in the rain barrel, so it went through several rinsings. Then into the washing machine and through two cycles to be sure the bleach was removed. These pieces will be used in my coat....I hope!! Here they are, in all their rusty glory! I'm happy with the piece shown below, but the larger piece (shown above) is in need of another dose of rust. The nicer piece was done around the steel wool-wrapped cardboard tube. The vinegar made the steel wool rust amazingly well (and fast). I need to wash the fabric yet to see how much of the colour fades, but hopefully not too much. The larger piece was the one I wrapped around a rusty piece of metal pole and the colours came out much more faded and also in a striped pattern. This one is going back to the drawing board and will be rewrapped the other way on. Hmmm...maybe I'll end up with a plaid effect? Of course I ran out of vinegar and need to get more before I can proceed. Tomorrow I hope to show you pictures of the shibori I did over the weekend. Stay tuned!